The thing is, most companies know they should be sending emails, but they’re not sure how to do it the best way possible. In order to send better emails to hit inbound lead goals, here are some basic best practices that you can apply to your own email marketing campaigns to improve their performance. One of the reasons that emails are great is because they are scalable: write one email, and send it to as many people as possible. The thing is, not every email fits every customer. The more generic your email is, the more likely that your audience will ignore it as spam. Yet, many businesses use a "spray and pray" approach to email marketing, where they send an email to their entire list hoping to get a small percentage to engage. Here's a tip: segment your list before you send your emails, and craft a personal message to each email segment. You probably have information on these segments that you can use to tailor messages directly for theri group....USE IT! This method is still scalable, and with a little effort, your email will be a better fit and therefore more successful. Send different emails to leads as opposed to previous customers. If you’re not separating these groups already, this information should be extremely easy to apply moving forward. Organize your email database by what stage a lead is in the decision-making process. If your lead has already spoken to a sales representative but hasn’t made a purchase yet, you should be sending emails that are tailored to this unique situation. Create a rule for your list that updates what emails to send once a recipient opens more emails and clicks the links in them. An involved reader will take much more significant action than someone who ignored most of your emails. If you have this data, use it to make your call to action closer to a purchase decision. Emails are persistent, so you can send them any time and day and they’ll stay in the recipient’s inbox. The problem is that an email can get buried under other emails with time. Once there are too many marketing emails, they’re probably going to get deleted in bulk. Emails that stay unopened longer are more likely to seem irrelevant to the recipient, too. Old emails will probably get deleted. Send on work days, Monday through Friday, excluding holidays. Send between 9:00 AM and 2:00 PM. The very best time is 10:00 AM. Send within these parameters for one month. Study the data and then switch it up. Compare the results from the two different times/days, and then you'll see which time/day your audience responds to best. Repeat this exercise, testing different times/days, until you've arrived at the optimal time/day for your audience. Your emails will reach people at the time when they are most likely to open them. Better timing means more emails opened. Just like with testing different times/days, you want to test different types of subject lines to see which ones resonate with your audience. Here are a few do's and don'ts when it comes to email marketing subject lines. Make your subject line no more than 50 characters. Any more and you risk having it truncated (meaning your recipient will see the little dots after the ti…). And now with more and more people opening email on their mobile devices, it's even more important to make sure your subject lines are short and concise. Include action words. You want your recipient to take an action (ie open the email), so include action words in the subject line that will get them moving. Test your subject lines to see which style resonates with your recipients. Say "Thank you" when applicable. Pretend that your email is a forward or reply email when it isn’t. That means using "Re" or "Fwd" at the beginning of your subject line. Your recpients will be turned off once they realized you've tried to dupe them into opening the email. Send different emails under the exact same subject line. Use ALL CAPS. It's annoying, it screams "SPAM" and will turn off your recipients. Use the word "Urgent". Instead use the word "Today". Personalize the subject line to include the recipients first name. Some sources say that this is something you should do, others say you should avoid it. Try it out for yourself and see whether your audience responds powerfully or not. If it works, great! If not, then move on. The real core of your email is going to be the body. Unfortunately, being able to say so much in the body of an email can often work against the sender. Emails that require more than a glance are usually ignored for the sake of saving time. Let us show you how to avoid saying too much, and help you present the most important parts with style. 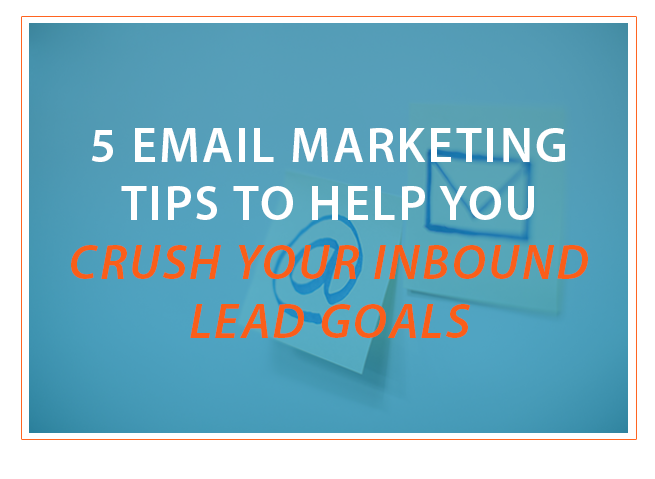 Your emails will be generating more inbound leads in no time. Your main point in an email should be how the call to action will benefit the reader. Use boldface for your most important message so readers can get the point by simply scanning the email. Use a short, simple bullet list for any additional information, such as helpful statistics. Your content should be no more than two paragraphs, preferably one. Research clearly shows that people open about half of all their emails on mobile devices now. What happens when an email opened on a smartphone isn’t mobile friendly? It gets ignored, deleted, or marked as spam. You don’t want that. You want to be generating more inbound leads, so mobile friendliness is a no-brainer. Use only 1 to 3 images. Only add them when necessary, and don’t put your content into an image because it might not even display. Format emails in a single column so users don’t have to scroll and zoom to read everything. Keep everything simple and short. Use only one call to action and make it obvious. In the end, we don’t send emails just to get attention for our brands. We’re sending them to convert customers and help us achieve inbound marketing goals we set. It’s good to keep those goals in mind. Sometimes we congratulate ourselves on how much content is in the email or how many people we sent the email to. Just stay focused: we want those potential customers to open these emails and follow the links inside them. Without effective email marketing practices, you may not be able to hit the inbound lead goals you set. By using better email marketing practices, we make emails that are ultimately better for the end user, which is a win-win situation for the sender.